An attractive rural small holding comprising a detached period cottage, agricultural buildings, two polytunnels and 34 acres (13.75 hectares) of grazing land, including two ponds situated on Stone Cliffs on the Isle of Oxney enjoying elevated panoramic views out across the Romney Marshes. An attractive rural small holding comprising a detached period cottage, agricultural buildings, two polytunnels and 34 acres (13.75 hectares) of grazing land, including two ponds situated on Stone Cliffs on the Isle of Oxney enjoying elevated panoramic views out across the Romney Marshes. DIRECTIONS: Exit the historic Cinque Ports town of Tenterden following the B2080 via Reading Street towards Appledore and approaching the village outskirts at the minor crossroads take the right hand turning signposted to Stone. Follow this lane past The Ferry Inn public house on your left and on through the village. Immediately before the building that was formerly The Crown Inn take the left hand turning in to The Street. Continue on as the lane becomes Church Hill up past St Mary The Virgin church and at the minor T-junction turn left in to Knock Hill. Continue along this single track lane and the entrance to Mackley Farm will be found on the left hand side, set off a minor right hand bend (if you reach the bottom of the hill you have travelled too far). SITUATION: Mackley Farm occupies a fine rural location enjoying elevated panoramic views across the Romney Marshes to the coast and historic Cinque Ports town of Rye, which provides a comprehensive range of amenities including a range of independent shops and professional services. Popular Camber Sands is situated 8.2 miles distance. The historic Cinque Ports town of Tenterden is situated 8.3 miles distance also providing a comprehensive range of amenities. Excellent educational facilities are provided in both the state and private sectors, including Grammar schools at Ashford , which also offers Ashford International railway station providing services to Lille, Paris and Brussels. A railway station in Rye provides the marsh link to Hastings and Ashford. VIEWING: Strictly by appointment with our Cranbrook Office (01580) 712888. LOCAL AUTHORITY: Ashford Borough Council www.ashford.gov.uk. SERVICES: Mains electricity and water, oil fired central heating, private drainage. DESCRIPTION: Mackley Farm is an attractive rural smallholding comprising a detached period cottage with later additions, presenting mixed elevations of mellow brick and white weatherboarding, set with predominantly UPVC double glazed windows and a dormer window beneath a pitched clay tile roof with catslide. The character accommodation is arranged over two floors and is briefly described as follows; sitting room with timbers to ceiling and inglenook fireplace housing woodburning stove, aspect to front enjoying fine rural views, study with timbers to ceiling, dining room with timbers to wall and ceiling, pleasant outlook across garden, kitchen/breakfast room fitted with base and eye level cupboards and drawers, fitted round edge work surfaces, 1 1/2 bowl stainless steel sink unit with mixer tap over, space and plumbing for washing machine and dishwasher, attractive woodburning stove and tiled floor, aspect to side, useful utility room, ground floor bathroom fitted with a white suite comprising closed coupled wc, pedestal wash hand basin, panelled bath with Tenterden 8.3 miles Rye 4.6 miles Ashford International Railway Station 12.7 miles Triton electric shower over. First floor landing, exposed studwork , access to roof space, latched cottage doors leading off to three bedrooms incorporating two double rooms and one single room, all enjoying distant views out across the Romney Marshes. A separate cloakroom accessed off the landing is fitted with a close coupled low level wc and wash hand basin. OUTSIDE: A driveway leads to the property from Knock Hill and a short section is subject to a right of way accessing the vendor’s retained land. The drive leads to an open area for parking, within which is located: a) Concrete sectional Double Garage with power and light b) Two polytunnels (17m x 6.7m) c) A steel framed Barn with corrugated fibre cement and tin cladding (9.95m x 6.45m) d) Pole Barn with Lean-to (8.24m x 4.4m) Adjacent to the cottage is an area of formal lawned garden with two fruit trees, brick and paved patio area, ornamental pond and rabbit fenced kitchen garden area. THE FARMLAND: Mackley Farmhouse lays central to its land which extends in all to some 34 acres (13.75 hectares) of mainly fenced pasture land divided into a number of manageable grazing enclosures and also includes approx. 2 acres (0.8 hectares) of attractive ponds and shaws. The prominent position of the cottage central to the property means it has commanding views over its own and adjacent land and towards Stone-in-Oxney church. The farm has a Camping and Caravan Club licence allowing the stationing of up to five caravans and unlimited camping. Further details available on request. 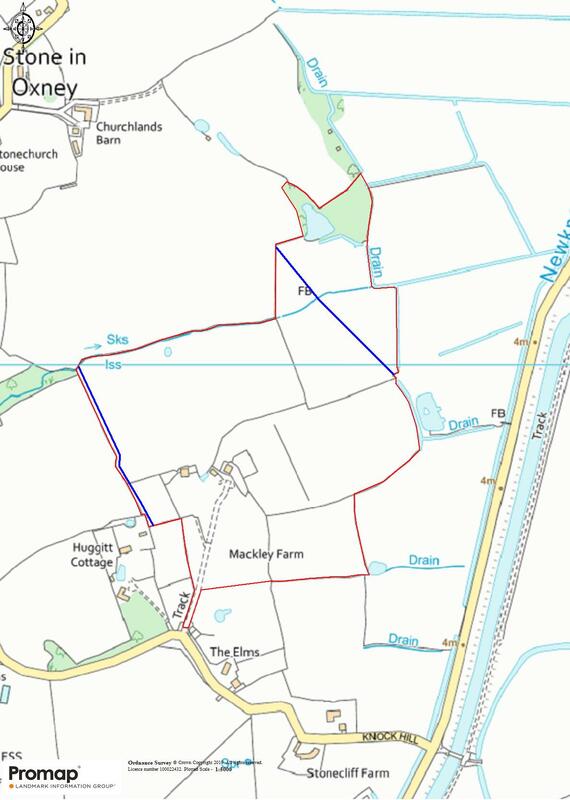 AGENT’S NOTE: Two public footpaths cross the land, the routes of which are shown by blue lines on the sale plan. A neighbouring farmer has a right of access to one of his fields through the woodland parcel located on the northern boundary of the farm. PARTICULARS, PLANS AND SCHEDULES: The particulars and acreages stated therein, together with the plans are believed but not guaranteed to be correct. They are given by the Agents to assist viewers but are specifically excluded from any contract and prospective purchasers must satisfy themselves as to the information contained therein. ANTI MONEY LAUNDERING COMPLIANCE (AML): In accordance with Money Laundering Regulations, we are now required to obtain proof of identification for all vendors and purchasers. You will need to supply information required for us to complete our identification checks which will include your date of birth, main residential address and a colour copy of your passport or photo driving licence. Lambert & Foster apologise for any inconvenience this may cause, but it is a legal requirement. Unfortunately, Lambert & Foster will not be able to conclude a sale on your behalf to any person or people who are unable to provide confirmation of identification. Note: Lambert & Foster currently employs the services of Smartsearch to verify the identity and address of vendors/ purchasers.